« Catching Stardust is here! 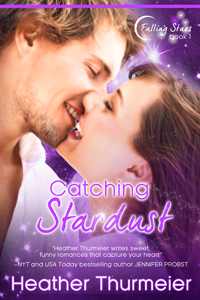 CATCHING STARDUST is now available in digital and in PRINT! This is the first of a brand new series (Falling Stars) and a totally *different* kind of paranormal romance. Maia is one of the seven sisters of Pleiades who has been sent to Earth for her own protection from Orion the hunter stalking her around the universe. Maia has one goal, survive Earth long enough to get back to the stars so she can make Orion pay… until she meets Zander and her priorities change. “Sorry we got interrupted.” Zander tucked a strand of hair behind her ear. “It’s probably for the better.” She rolled on to her back away from him and stared up at the sky, trying to soak it in as much as she could before she had to go back to the city and the light pollution that came with it. Zander followed her, rolling over so he hovered above her but she put her fingers on his mouth, blocking him from kissing her more. Being interrupted by James had been a blessing in disguise. She wanted to, but she couldn’t be with someone who didn’t even know who she really was. She wasn’t ready to tell him the truth about her—she could never do that. So how could she be with him physically when he didn’t even know who she was, what she was? Zander rolled onto his back beside her and peered up at the sky. He sighed and rubbed his hands across his face as if massaging away the pent up tension he undoubtedly felt. “I’m sorry,” she said softly. Her heart clenched. She didn’t want to stop kissing him. In fact she wanted to do a whole lot more than kiss. She probably would have if they hadn’t been interrupted. But she couldn’t let herself get caught up in a moment she’d regret later. She couldn’t let herself take things further with Zander knowing they both stood to get hurt if she did. This pain was easier to bear. Much easier. He kissed her softly on the lips—a kiss that didn’t ask to lead to anything more. Maia dressed quickly then finished packing up all of their things while Zander dressed. Together they made their way back down the now pitch-black staircase with the aid of a flashlight out of the picnic supplies and to the main road leading back to the station. They stopped into a tiny café that was still busy despite the late hour and ordered hot chocolates for the ride home. Then walked across the street to the station as the next train pulled in. Finding seats in an empty car, they sat beside each other. Zander draped his arm across her shoulders and she snuggled in tightly against him. A new kind of warmth filled her chest. She breathed in his scent as she cuddled against him—just as manly as she remembered it from his jacket, only stronger and mixed with the smell of lake water. For a water nymph, the scents mixing played to her deepest desires on the most primal level. The train rocked back and forth as it traveled down the tracks, soothing and rhythmic. The weight of another day on Earth began to settle in and her eyes threatened to drift shut. Forcing her eyes to stay open, she turned to the window. A reflection of herself and Zander in each other’s arms stared back at her. A longing, deep in her heart ached for the possible future she saw in the reflection—a future she never thought she wanted, but now sort of did, even if it went against what she knew was right. She’d never thought of trying to have a typical life on Earth, but with a guy like Zander by her side, maybe she could be happy here. Stars twinkled in the sky beyond their reflection, reminding her of home and the life she would lose if she chose to stay here. The life she’d known her whole eternity. The life she loved with her sisters. Could she really imagine a life that didn’t include going back to the stars?